Inspired by one of the greatest legends ever, Ancient Troy is a Greek mythology-themed video slot machine produced by Endorphina built with 5 reels, 3 rows, and 25 paylines. Taking you to the realm of war, drama, and betrayal, the game features Wilds, Scatters, Free Spins, Multipliers, and rewarding Risk Game and a static jackpot of 5.000 coins. 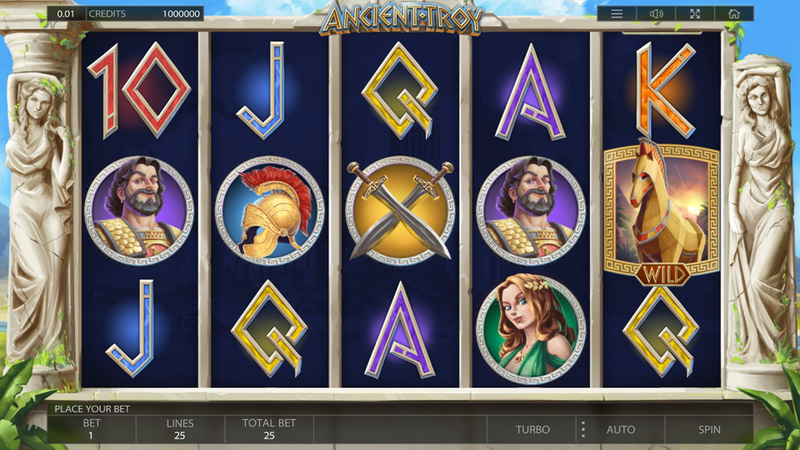 Find out more details and enjoy the beautiful scenery after reading the Ancient Troy slot review. Want to see how Ancient Troy works? Select a recommended casino site from the list below and start playing for free or real – our screenshots will give you a sneak peek! This is a game you can play for fun or for real money, depending on your ambitions and experience. In both cases, the book of rules remains intact, meaning that prospective winners must line up 3 or more matching symbols on adjacent reels to get paid. Those who want to learn how to win and pay nothing in front can start the Ancient Troy Free Play mode and enjoy the fully-featured game. Like in all themed slots, the paytable puts much trust in symbols closely related to the main course. You will find the famous Trojan Horse, brave Hector, beautiful Helena and Achilles the epic hero as items with a higher payout rating. Moreover, once a single Helena icon landed on the reels, it will turn into an Expanding Wild helping you form more winning combinations. In normal occasions, Achilles pays up to 850 coins, while Hector and the rest of the crew bring between 30 and 600 coins for combinations of 3 to 5 of a kind. Trojan Horse is the Wild and may not only improve the payline but act instead of all other items but the Scatter. With 3, 4 or 5 Wilds, you will receive 100, 500 or 1.000 coins, respectively. Arguably, Scatters trigger the Ancient Troy Bonus and the Scatter Pays mode. After each winning round, you can double the winnings up to 10x by triggering the Risk Game. From a deck of 4 cards, pick one and score if your hand is better than the dealer's. The coin value goes from as low as €0.01 all the way up to €1 allowing you to wager between €0.01 and €250 per round. What’s important for your betting strategy is the fact that 25 levels are adjustable, and you can place 1 to 10 coins per line. When 3, 4 or 5 Scatters land anywhere on the reels, you will receive a starting batch of 10 Ancient Troy Free Spins along with 50, 500 or 5.000 coins. Moreover, this feature is enriched with the special Trojan Joker associated with Multipliers of 1x, 2x and 3x. You can play online using any mobile device on Endorphina-powered sites since this release doesn’t ask a player to download the iPhone app or the Android .apk file. 3. What is the RTP factor of Ancient Troy? The Ancient Troy recension sticks to the official RTP info of 96.00%. The game is recommended for players of all experience levels since it not only grants a decent payout, but also comes with a valuable history lesson. Try the Ancient Troy tips and see if it’s possible to bring the house edge down for a percent or two.